I am a huge fan of polework for horses and use it often with Scottie. Polework isn’t just for jumpers! And nor is just for people who don’t want to leave the ground. It can be used to help teach a new movement, build muscle or even just give the horse something new to think about. I think polework is a fantastic training aid. It can help the horse understand the question and make the rider give clearer aids to the horse. Asking for transitions over a pole or between a tunnel of poles can be a great way to improve the quality of your transition. Similarly, asking for canter over a pole can also help you pick up the correct canter lead and is one of the go to solutions for people struggling to get this. 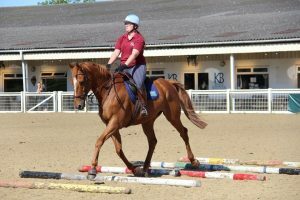 If your horse isn’t quite understanding the idea of lengthening or shortening, working them over poles with slightly longer or shorter distances can help them work out the aids for themselves. 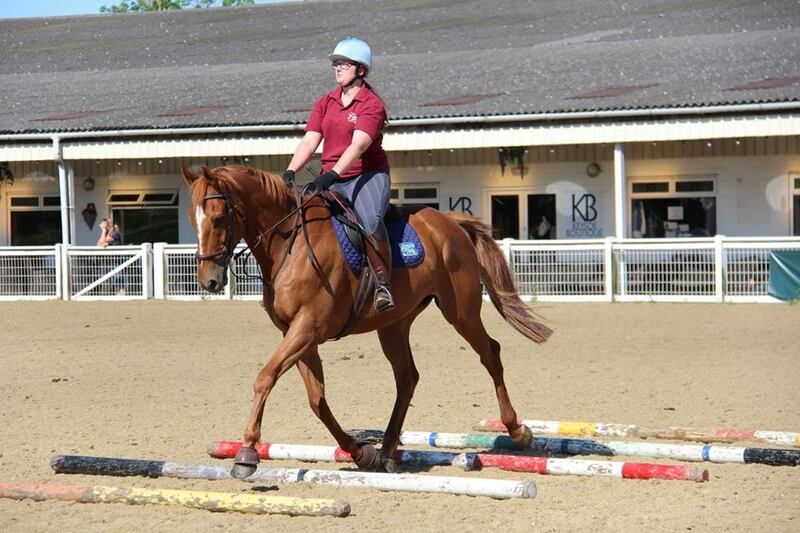 One of my favourite pole exercises has different lengths to encourage your horse to extend and shorten. When a horse works over poles, they have to raise and round their back to lift their legs. Many horses will also naturally lower their head and stretch over the poles which is just fantastic for them! Raising the poles will make their muscles work even harder. Unsurprisingly horses can get bored doing the same old things. Sometimes adding in some polework can really freshen them up. It could be as simple as a line of trot poles or asking for transitions over a pole. But most horses enjoy poles being incorporated into their usual routine. Some of my favourite exercises to get their brains working don’t ask a huge amount from them physically, but make them think. Most of these exercises can be done at walk as well as trot, ridden as well as led or long reined. You can see some of these exercises here. I’m a huge fan of pole work and agree with everything you’ve said! I especially agree that it is mentally stimulating for horses – I know I can get bored just going around the arena, so I can’t imagine how boring it is for the horse! I’ve found it’s good for Moe to learn where his feet are and actually gives him something to think about. I actually really like the grid of poles exercise you linked to – I think I’ll have to try out this weekend if we get rain and we’re arena bound! That’s one of my favourite exercises! Let me know how you get on!